We very much welcome your contributions in the form of media files (mainly individual photographs, but also identification keys, line drawings, etc.). These files could show distinctive characteristics of a butterfly species, or its morphological variation, habits, habitat, early stages (eggs, caterpillars and pupae), and so on. The media files will form a bulk of the species pages and most of our user contributions. If this is the first time you are considering contributing to Butterflies of India, please read the guidelines in their entirety before submitting your files and associated information. It is a long list, but please pay attention since this affects the quality of images and other data displayed on this website. Also, review the media guide below. 1. Images are submitted online at http://www.ifoundbutterflies.org/submit-observations. There is a simple registration form to complete before you start contributing images. 3. Showing the phenotype and behaviour of the butterfly is our top priority, rather than compositions and other photographic considerations. So, before uploading, images should be cropped close to the butterfly at 680 x 470 pixels (width x height), or if larger, in that ratio. Images that are in different width x height ratios, or images composed vertically, may be used but horizontal compositions at 680 x 470 pixels display the best on this website. No need to optimize the file size, this is done automatically when images are uploaded. When included in the species page, all picture files will appear 345 pixels wide. When clicked, these files will open in their full 700 pixels-wide size. Some of this is explained in the media guide below, and samples of how this works can be seen on any species page (look under the "Photo Gallery" tab on species pages, and click on any picture). 5. Each media file will be assigned a unique media code by the website. In case a user wants to refer to a specific media file, the unique media code will be used as the digital object identifier. We will maintain a database of the media files to keep track of the contributors and their contributions. When known, please add gender and seasonal form of the individual. If known, also choose whether the female was laying eggs. There are separate fields where you can enter this type of information. This adds valuable information for the users, which gets databased, and improves search results. 7. When you contribute images and are selecting the butterfly name, please choose names at the subspecies level if subspecies are listed under that species (e.g., Mycalesis visala visala rather than Mycalesis visala). This will help us process your images much faster, and then you will get to see your images online much sooner. If you do not know the subspecies in your area, the easiest way to find out is to visit the species page, and look at the distributional map. The English names of subspecies also often provide a clue. Of course, if you do not know the species or subspecies names, we will fill this in. It saves us time if you know your subspecies, though, and this will also help us build a better dataset that can be used in many biological and taxonomic studies and conservation action. 8. If you are adding images from a location that is not already in our database, you can add the location but please ensure that the location details are in this strict format: Specific location, District, State, India; e.g., (a) "Deban, Namdapha NP, Changlang District, Arunachal Pradesh, India. ", or (b) "Songaon, Ratnagiri District, Maharashtra, India." If you are doing this, you are also encouraged to add latitude and longitude. 9. Read the notes on the image submission form and double-check your submissions before ticking the "Confirm" box so that we have accurate records. It is very important that you ensure that dates and locations are entered correctly. Your records cannot be seen, reviewed and uploaded on the website until you have clicked the "Confirm" box at the end of the page on which you submit images. 10. For species which are hard to identify, if possible (if you have images), upload images of butterflies showing upper and undersides. This often helps in identification. Some of the images may not be particularly good, but upload them, anyway, if those images are likely to aid identification. The images uploaded just for identification can be discarded after review so they will not appear online but they will improve confidence in our identifications. You can add a note to this effect if you want. For common and easy species, however, avoid uploading more than one image of an individual since more images do not add anything to the spot record (but they do crowd the website). 11. All the information and images contributed and subsequently displayed on the website are automatically databased. The database is the backbone of all our searches and maps, and it is centred on spot records. A spot record is a record of an individual butterfly/mating pair/egg(clutch)/caterpillar/pupa. One spot record may be represented by multuple images (e.g., upper and underside of an individual, a full view and a close-up, or a pupation sequence). So, if you are contributing multiple images of the same individual taken at the same time, then those images should be uploaded at the same time as a single spot record, i.e., an "observation" (select the entire set of images for the same spot record when you upload images for that observation). Then those images will be given separate media codes but in the database they will represent the same individual/spot record/observation. If you photograph multiple individuals of a species at the same time and place, they should be uploaded separately as they represent distinct spot records. If you document the lifecycle of a butterfly from a single caterpillar, each image should be uploaded separately since, e.g., the early instar, the late instar and the pupa would have been photographed on different days. 12. We require the image quality to be good. Images that do not meet quality standards will be rejected. However, images of very rare species may be accepted even if they are not so good because those species are not well-represented on the website, anyway. 13. After submission, each and every media file will be checked for accuracy of identification and associated data by members of the website team. This applies to all the media files, even those contributed by the most reliable butterfly biologists in India. Such peer review is critical in maintaining high standards of information on the website. Please check your contributions once they appear online. If you disagree with species determination by the website team or spot any other issues, write to us to discuss the reasons. 14. The copyright of individual images remains with the contributors. We ensure that the individual copyright is mentioned in every place where the images appear to give the photographers fair credit for their valuable work. 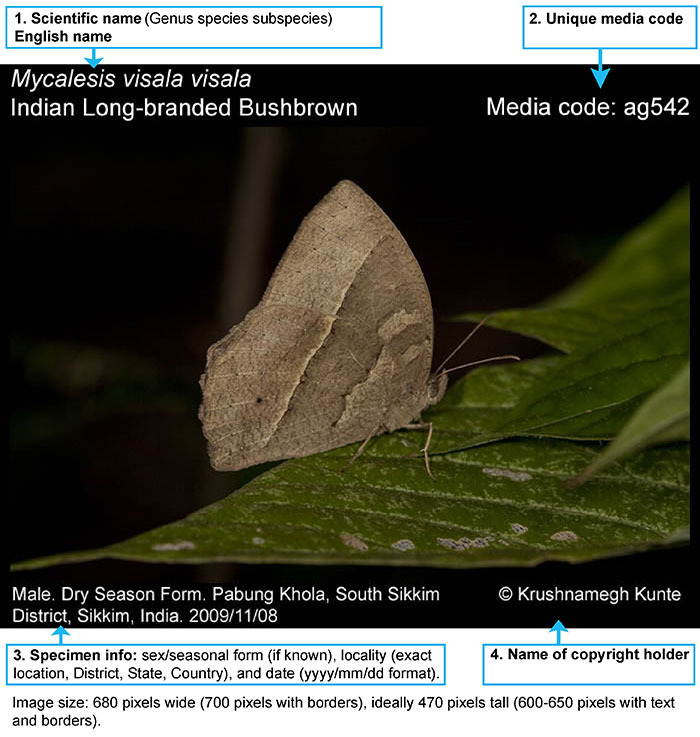 However, please note that the National Centre for Biological Science holds the copyright on compiled information, including the rights to display contributed images, that is on the Butterflies of India website. Therefore, even if photographers hold copyright for the individual images, they expressly agree to NCBS's rights to display the contributed images on the website. Thus, once contributed to the website, image copies contributed to the website cannot be retracted by the photographers because they form the copyrighted compilation on the website. Also, please read our authorship policy. Contributors expressly agree to these guidelines and policies when they contribute their photographs and other media files to the Butterflies of India website, and therefore agree for their images to be used on the website in perpetuity for the specific purpose for which they were contributed. If you face any issues in submitting images, please contact Purnendu Roy and Krushnamegh Kunte. We look forward to your contributions to this free, citizen-contributed, peer-reviewed, reference website on Indian butterflies. We are all working to build this website on a voluntary basis but, as a team, we are working almost round the clock to peer-review and process your images and put them online. So please be patient if your images do not appear online immediately. Peer review sometimes takes time, but it is an important step. Kunte, K., S. Sondhi, U. Kodandaramaiah, and P. Roy. 2019. Contributing Media Files (photos) To Butterflies Of India. In Kunte, K., S. Sondhi, and P. Roy (Chief Editors). Butterflies of India, v. 2.61. Indian Foundation for Butterflies.